Everything has its end :). and FOSS.my 2008, ended a great SUCCESS!!. It's been a fun roller coaster ride being a FOSS.my 2008 crew. All the rushing, stress, tears and blood to get things prepared before the event, and all the running all over APIIT during the event to keep everything ok, the lack of sleep and rest, losing the chance to hear most of the talks, etc, paid off when seeing everything went smoothly without any major noticable problems. To be frank, I was quite scared during preparation day (Friday) considering soo many things not yet done such as tags, posters, signages, failure handling plans, etc. But all well ends well, we somehow managed to get most of them done in 24hours and prepared for the big day. Can you believe that this came out of nowhere in 1 hour??!!. I think I've been wearing quite a number of hats throughout the whole FOSS.my. From being the publication guy for the posters and tags, to being a bit of tech support for some machines, to getting the slides to the TV system, and finally settling down to helping the lunch and tea break flow running smoothly, and also accompanying Pia Waugh to the cinema to watch James Bond latest movie after the speaker dinner, it was a really crazy 3 days, but fun nonetheless. I only managed to hear the day1 closing keynote by Pia Waugh and part of the memcached talk by Toru Maesaka. Hoped to be able to hear more, but I guess I need to wait for the video recording (hopefully the recordings went well). Sadly, I had to leave early today on 1pm before FOSS.my2008 totally ended, mainly because I will be having an exam tomorrow morning on 9am, and I need to travel back to my university, which is around 5 hours travel by bus. After quickly saying goodbye to a number of crew, and briefing yondie and the awesome food and beverages volunteers about what to do for lunch and tea break, I left APIIT to the bus station. Looking through pics tagged with foss.my on flicker, I also noticed that I also missed the crew lineup after the final closing keynote. T_T. I want to be there T_T. i believe #foss.my ended now. wish can still be there. lot of problems at prep day n 1st day but very happy that #foss.my ended a success. aizatto, angch, colin, ditesh, firdaus, yk, wariola, yondie, saleh and all #myoss guys. #foss.my wouldnt have even started without y'all. #foss.my volunteers, especially those who helped in food and beverages. y'all rox!. though i hoped that y'all were here to help during preparation. still, y'all rox!! 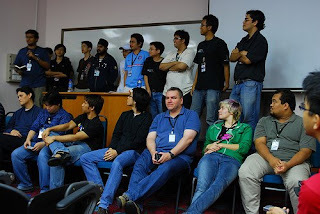 not to be forgotten #foss.my attendees. without all of you #foss.my wouldn't have be as awesome!!! #foss.my : the world is just AWESOME!! FOSS.my 2008 was AWESOME!! .. 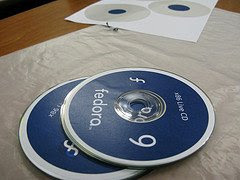 Looking forward for FOSS.my 2009!!. Hope to see y'all again next year! !.